Created by Dr. James L. Castner and Dr. Jason H. Byrd, editors of the reference book Forensic Entomology, the Forensic Insect Identification Cards present 52 color photographs of the insect and arthropod fauna most commonly encountered on human remains. 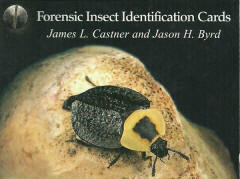 Dr. Castner has used his photographic skills and entomological knowledge and Dr. Byrd his crime scene experience and forensic expertise to produce this unique guide and tool. These cards are a useful resource for crime scene technicians, medical examiners, forensic investigators, law enforcement officials, and any student of the forensic or entomological sciences. Approximately the size of a deck of cards, a color photograph of the insect subject appears on the front along with the name and a size scale, while on the back is a description of the insect and information on its distribution and habits. Specially designed for use in the field, the cards are laminated for durability and held together with a grommet in one corner that allows for quick and easy reference to each card. The size of the deck allows them to fit easily in a pocket or tool kit. The Forensic Insect Identification Cards should be a part of the essential tools brought to any death scene. These cards even appeared in an episode of CSI: Crime Scene Investigation. 59 pages. 53 color photos. 3 x 4 inches. Grommet/screwpost bound.